Jim Harrison is one of America's most beloved and critically-acclaimed authors--on a par with American literary greats like Richard Ford, Anne Tyler, Robert Stone, Russell Banks, and Ann Beattie. 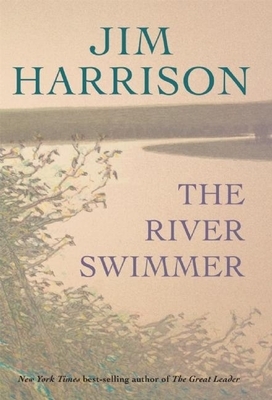 His latest collection of novellas, The River Swimmer, is Harrison at his most memorable: a brilliant rendering of two men striving to find their way in the world, written with freshness, abundant wit, and profound humanity. In The Land of Unlikeness, sixty-year-old art history academic Clive--a failed artist, divorced and grappling with the vagaries of his declining years--reluctantly returns to his family's Michigan farmhouse to visit his aging mother. The return to familiar territory triggers a jolt of renewal--of ardor for his high school love, of his relationship with his estranged daughter, and of his own lost love of painting. In Water Baby, Harrison ventures into the magical as an Upper Peninsula farm boy is irresistibly drawn to the water as an escape, and sees otherworldly creatures there. Faced with the injustice and pressure of coming of age, he takes to the river and follows its siren song all the way across Lake Michigan. The River Swimmer is a striking portrait of two richly-drawn, profoundly human characters, and an exceptional reminder of why Jim Harrison is one of the most cherished and important writers at work today. Jim Harrison is the author of over thirty books of poetry, nonfiction, and fiction, including Legends of the Fall, The Road Home, Returning to Earth, and The Summer He Didn't Die. A member of American Academy of Arts and Letters and winner of a Guggenheim Fellowship, he has had work published in twenty-seven languages. Harrison lives in Montana and Arizona.